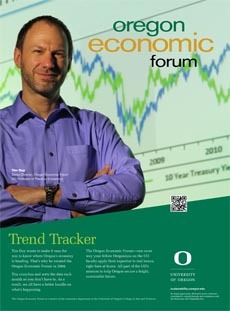 KVAL interview on the Oregon economy (state economist Josh Lehner also interviewed). Macro Musings podcast on the Yield Curve, Inflation Targeting, and the Federal Reserve. Bloomberg interview on monetary policy. Washington Post story on the financial crisis of 2008. Interview with Oregon Business magazine. And, finally, my Bloomberg column this week. Third: Below is the University of Oregon Regional Economic Indexes for July 2018. For all regions covered by this report, both raw and moving average measures (which smooth monthly volatility) were above zero, indicating an above-trend pace of activity (trend activity differs across regions). Housing permits were on the soft side in July, generally neutral to negative. The exception was the central Oregon region; Deschutes County permits have been running in their pre-bubble range of 150-200 per month since the beginning of 2015. Employment components were generally neutral to positive across all regions. Steady economic activity and population growth continue to fuel municipal waste production, creating a positive contribution to the measures. Low unemployment rates and low initial unemployment claims continued to make large positive contributions to the measures; the latter suggest job growth is likely to continue in the months ahead. There is no indication in the data that the current expansion is likely to end anytime soon.